1. How old is my Manhattan? guesses and get within a year or two. Look in the Manhattan guide pages for more info. 2. What models did Manhattan make? the .22 caliber cartridge revolver. See my Manhattan Guide pages for other models. 3. 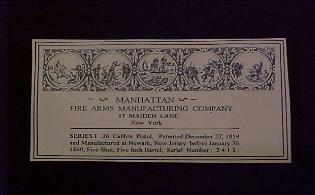 Where can I find more information on Manhattan Firearms Manufacturing Co.? "Flayderman's Guide to Antique American Firearms. . . and their values". 4. What is my Manhattan worth? guides such as Flayderman's Guide as a starting point. 5. What can you tell me about my Manhattan shotgun? 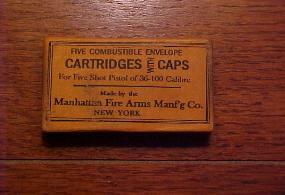 Manhattan Firearms Company did not make any Shotguns. They only made pistols. They were all sold by Schoverling,Daley & Gates. 6. Should I fix, refinish, or repair my gun? what you are doing. It is usually best to leave it alone, that's what I do. 7. Can I shoot my Manhattan or American Standard Tool Co .22 revolver? 8. Were there any Manhattans used in the Civil War? cartridges. This was payment for a shipment of the new .22 revolvers that had been mistakenly confiscated. 9. WOW! My Manhattan Firearms Pistol is engraved! is rare on a average Colt Navy. It is rare to not see a scene on an average Manhattan Navy. 10. Who the heck are you and who made you the expert on Manhattan Firearms? and how you acquired it. 11. What do you call all of the parts?? view, Thanks to Jerry B. for this layout! 12. Where do I get parts?? and screws. But they sometimes also need a little file work to fit. 13. What happened to the Manhattan Factory? building, the Ironclad U.S.S. Monitor was designed there by John Ericsson! 14. How much did a "new" Manhattan cost? pistols at the time of the Civil War were around $9.00. 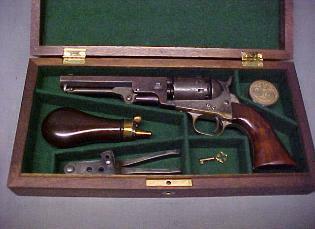 Navy (.36 caliber) pistols were around $13.00. 15. Does a Manhattan have a "blade" style front sight or a "post" style sight? Either type is possible. The post-type sight is rarer and seems to be used mostly on later model 4" and 4 1/2"
barrels. The smaller Pocket (.31 caliber) models also have both sight types. quality job making reproduction cases etc. 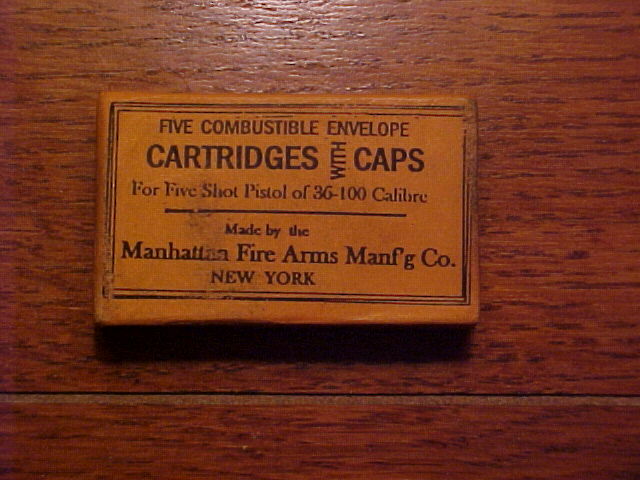 cases ad well as a great cartridge packet. this ad, he just makes good stuff!! As far as I know the Manhattan factory records are lost. I wish I could find them!! !